A neat feature of Wireshark is the ability to decrypt SSL traffic. This post is about why you might want to do it, how to do it, why it works, and how to decrease the chances of other people being able to decrypt your “secure” traffic. 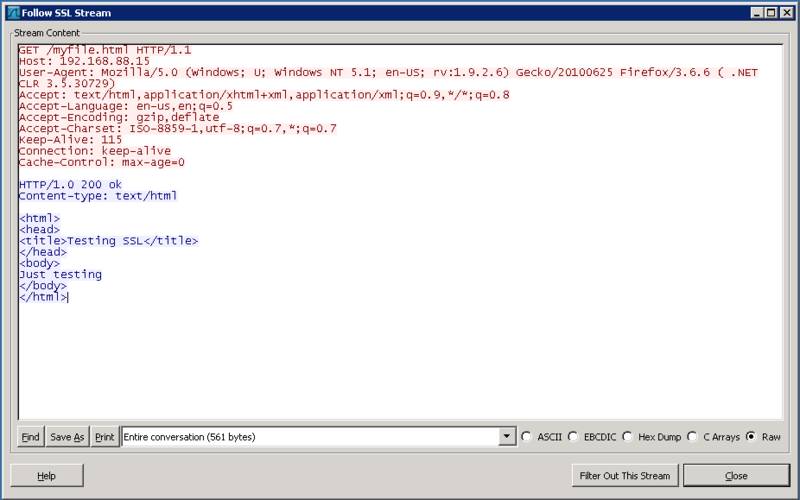 Debugging applications that run over SSL (HTTP, SMTP, POP3, IMAP, FTP, etc). Feeding a decrypted traffic stream to an IDS. Having the best signatures in the world won’t help if all your sensors see is encrypted traffic. Learning about SSL. What better way to understand something than to take it apart and put it back together again? To illustrate the process, we’re going to use OpenSSL to generate a certificate and act as a web server running HTTP over SSL (aka HTTPS) – it’s quite straightforward. The -key and -cert parameters to the s_server command reference the files we’ve just created, and the -WWW parameter (this one is case sensitive) causes OpenSSL to act like a simple web server capable of retrieving files in the current directory (I created a simple test file called myfile.html for the purposes of the test). The -cipher parameter tells the server to use a particular cipher suite – I’m using RC4-SHA because that’s what’s used when you go to https://www.google.com. The RC4-SHA cipher suite will use RSA keys for authentication and key exchange, 128-bit RC4 for encryption, and SHA1 for hashing. Fire up Wireshark on the server machine, ideally with a capture filter like “tcp port 443” so that we don’t capture any unnecessary traffic. Once we’re capturing, point your browser (running on a different machine) at https://myserver/myfile.html and stop the capture once it’s complete. 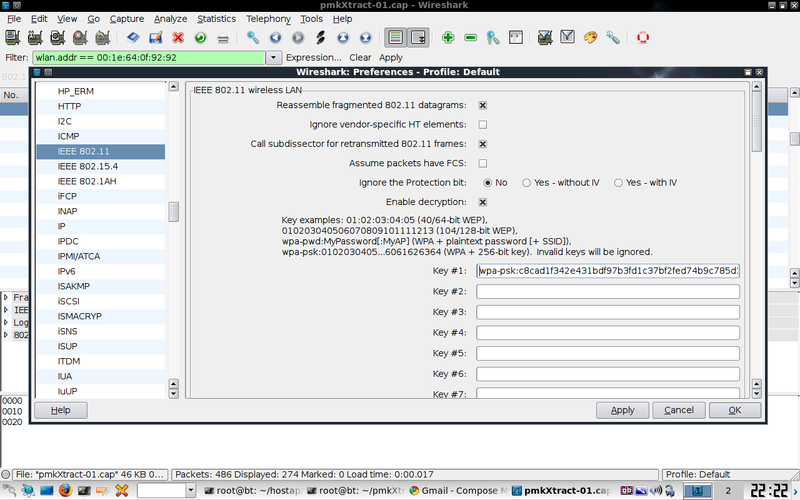 Close the TCP Stream window and select Preferences from Wireshark’s Edit menu. Expand the “Protocols” node in the tree on the left and scroll down to SSL (in newer versions of Wireshark, you can open the node and type SSL and it will take you there). You can read about this step in the Wireshark Wiki here. With RSA, key exchange and server authentication are combined. The public key may be either contained in the server’s certificate or may be a temporary RSA key sent in a server key exchange message. After verifying the server’s certificate, the client encrypts a pre_master_secret with the server’s public key. The server can of course decrypt the pre_master_secret passed to it by the client (by using the server’s private key in testkey.pem), and subsequently both the client and the server derive the master_secret from it – this is the symmetric key that both parties will use with RC4 to encrypt the session. But the server isn’t the only one with the private key that corresponds to the public key in the server’s certificate – Wireshark has it as well. This means it is able to decrypt the pre_master_secret on its way from the client to the server, and thereafter derive the master_secret needed to decrypt the traffic. The Operating System (Windows XP in this case) does not let you export the private key of a certificate if it is marked as non-exportable. However, the OS must have access to read the private key in order to use it for signing and encrypting. If the OS can access the private key and we control the OS, then we can also access the private key. We’ve changed the cipher from RC4 to 256 bit AES – this step is just to prove that Wireshark can decrypt AES as well as RC4. If you’re using a browser other than IE (my IE8 doesn’t seem to support DH with RSA certificates), Wireshark is totally unable to decrypt the HTTP traffic, even though it is in possession of the server’s private key. 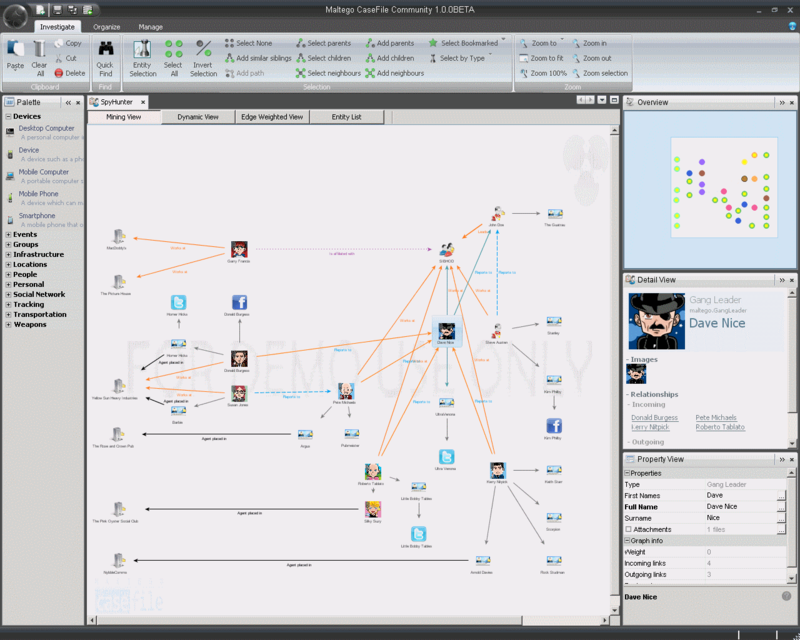 A DH key exchange is by design resistant to eavesdropping, although can be susceptible to a man-in-the-middle attack unless both parties identify themselves with certificates. It’s also, as we’ve seen, not universally supported by common SSL clients. But at least it rules out the possibility of some wiseguy with Wireshark sticking his fins where they’re not wanted! I have made some improvements to the viewssld package, which allows inline SSL decryption on your Snort/Sguil/etc boxes. You can read all about it here. you may want to consider a CCNA training course.